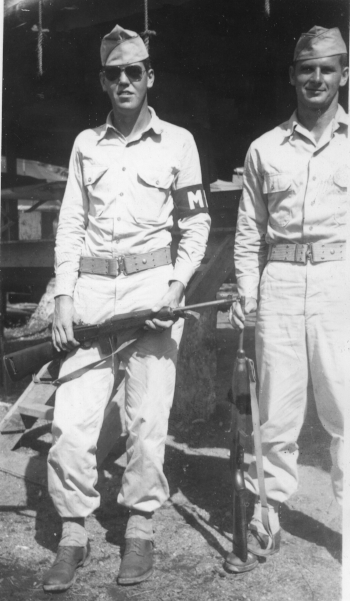 My Uncle Bill in the Philippines, September 1945. I’ve been compiling letters from World War II that will become the collection, A Philadelphia Family Goes to War, for release in December. I am repeatedly surprised how their sincerity and truthfulness are so noble that they seem stereotyped, they seem clichéd by today’s standards. We read them from a 21st Century perspective and doubt or miss or question their reality. I have approximately 500 letters—post cards, V-mail, form letters, and beautifully handwritten letters from November 1942 through November 1945—which chronicle my family’s experience of World War II. They are unedited letters among a father (my grandfather) and his daughter at home in Philadelphia and his sons—a Marine and a soldier, off to war around the world. While much of what they write is plain and mundane, much of it is so heartfelt and honest that it surprises me. These aren’t movie-scripted characters from the pen of a professional storyteller; these are real people seeing the real world and expressing it very differently than we do today…from a 1940’s perspective. 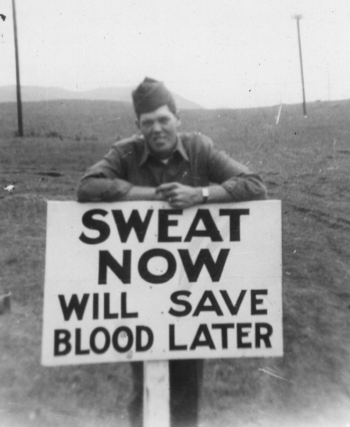 My Uncle Bill in training at Camp San Luis Obispo, March 1942. Dad don't let anyone tell you that MP's are non-combatants. Our men go right up with the doughboys & stay up there. Our area is, of course, in back of the infantry but if you have read about the Japs you know how they are experts at infiltration. Night before last 4 came up to about 100 yds of my bed. The boys in the dugouts shot one of them in the legs with a B.A.R. and then he held a hand grenade to his own chest & finished the job. I saw him next morning & altho it was the bloodiest, rottenest mess I've ever seen or want to see, I felt no sickness. Yes, Jack, we broke all records for a division in combat but to tell you the truth those doughboys don't give a damn for records or ribbons. You should see some of those kids who were up there for 110 days, they look like old men, tired eyes like dead men, dirty as hell, little cuts become ulcers from the filth & flies, every scratch becomes infected from lack of a good diet & no resistance. Uncle Bill on duty with “his buddy,” Sgt. Bader, New Guinea, May 1944. I am surprised to see how many Japs are surrendering. We have had over 1000 prisoners now since we've been overseas. This is not much considering the way the Germans gave up but then you can't compare them. The Nip is a good soldier & is plenty tough but he starts to wonder if he is right about the Americans when he sees the treatment he is given when captured & especially when wounded. We have one here a Jōtōhei [Superior Private] who speaks English quite well (a rarity) & he is really disgusted with himself for believing all the stuff his superiors told him about us & the way we torture a captive. I doubt if any of them would try to escape if given a chance. I saw one in N.G. who was pretty bad & lost a lot of blood, he was lying in a field hospital beside a doughboy. The Nip needed a blood transfusion in the worst way & the doughboy said to take some of his. That Jap cried for two days & nites. He couldn't get over it. The doughboy was hit himself. Oh well that's good old G.I. Joe for you. Everybody's a buddy when he's down and out. On this Memorial Day Weekend, I will probably watch some war movies…I used to think of them as entertaining clichés; but I’m changing my perspective. I’m learning that life—especially during intense times—offers many surprising perspectives.